I’m a cat person. I’ve owned dogs. For all kinds of reasons I like cats. I see no sense in arguing about which is the better species – cats or dogs. They’re like wine. Red or white. Can you really go wrong? It’s wine. Whatever your preference, life is better with a cat or a dog, or wine. All in moderation of course. The most I’ve had at one time is four. Cats that is. I’m not sure about wine. When we had four cats it wasn’t really on purpose, it’s like I lost count or something. But now I’m down to two. One in the Ohio garden and one in Tampa. But technically the cat in Tampa belongs to our son. Oh, I forgot one. My neighbor’s cat lives in my garage. He hasn’t left our property since 2010. I’m not sure if he counts toward my cat total. But I think I could add one or two and still not be considered a crazy cat lady. You be the judge. And if you would like to share your cat story I would love to hear it. During the winter I keep a bowl of food out for stray cats. I can only sleep at night knowing no cats go to sleep hungry. Especially in freezing temperatures. I also have a heated cat house and have seen as many as four cats come together for warmth when the temperature drops to single digits. Sometimes I see a certain cat for a few years in a row, five winters at the most, and then no more. 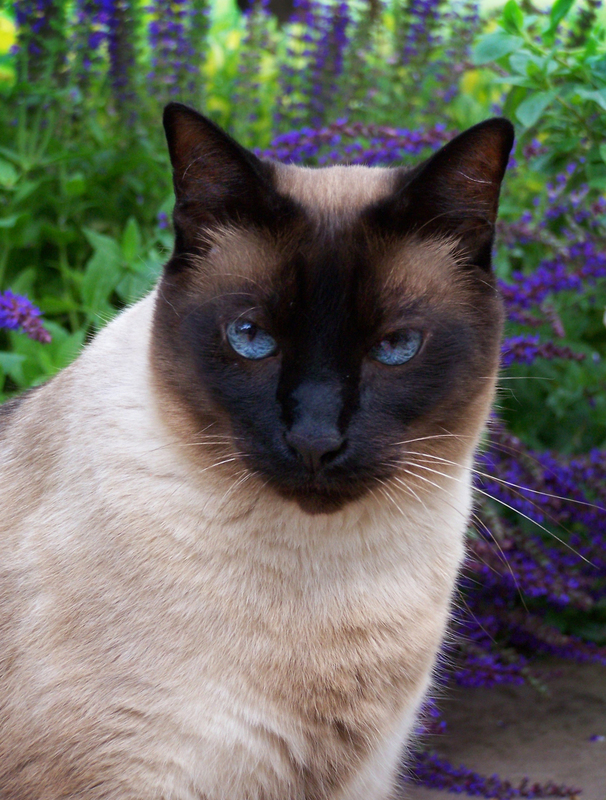 One January night I looked out the window to see a beautiful Siamese at the bowl. Who lets their Siamese out in the snow? I saw him again a few days later and I tried to approach him. He ran at the sound of the door latch. But he kept coming to eat and it became clear that not only was he very hungry and frightened, he was very lost. So I worked on him. Just letting him see me. Making eye contact. Looking away. No threat here. By spring I could be outside and work in the garden and he got curious in me. I started talking to him. And he talked back. 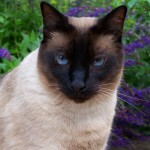 Siamese are known for that. Me, “So what’s new?” Cat, “Yeooooow.” Me, “I need two yards of mulch to keep these weeds down.” Cat, “Meeeeoooooow!” and back and forth it went like that for as long as I talked. Each day, bent over gardening, he’d watch and I’d move toward him a few inches until he’d run. One day he didn’t run. Instead, as I reached my hand out he hissed. I called his bluff, put my hand on top of his head and began petting him. He started to purr. Then flopped on his side and let me stroke the whole length of him. A long gash was healing on his hind quarters. He was neutered. His claws were so long they looked like talons. I had three cats at the time so the idea of keeping him was not a viable option. I put fliers in over 150 mailboxes around the neighborhood with no luck. So “The Plan” as I explained it to my husband who felt I was crossing the line into crazy-cat-lady territory, was to be his foster parent. We would just keep him until we found a forever home. I got help from our local kitty rescuers, Love-A-Stray. I made a donation, they vaccinated him, clipped his nails, and put his beautiful little mug shot on PetFinder.com. I got lots of calls. Many well intentioned suitors were rejected soundly by him. He was terrified. He ran from all of them. Me: “They wont hurt you little buddy.” Cat: “Meyoooooooow”. He became our fourth cat. Call me crazy. When I sit, he’s on my lap. When our oldest-wisest-coolest-cat of all time (Smokey) died from kidney failure, the now undefended bed was open. When I sleep, he lays on top of me. And yes, that’s very uncomfortable. His name is Pekoe. Named for orange pekoe tea. He still loves to garden with me and he can tell you all about it. Over ten years ago I discovered the perfect cat breed. It acts like a dog, and doesn’t shed. Their fur is super short, curly and soft and people with allergies can often tolerate them. I approached my husband with a brochure on the Devon Rex. On the cover was a pure white cat with short curly hair and enourmous ears, stretched out in a prize winning pose. “That is the ugliest cat I’ve ever seen.” Discussion followed, and ended with him saying “I’d be embarrassed to have people come to our house. They’d leave and talk about how weird our cat is all the way home.” And I’m thinking to myself, they drive home talking about how weird my husband is and it doesn’t stop me from keeping him. I hatched a plan. My friend Annie and her husband Mike are good friends. Mike happens to be highly allergic to cats and when they come to visit the poor man has to pop a Claratin-D to prevent sudden death by cat dander. This guy is seriously allergic. So I told Mike about my husband’s totally irrational aversion to the Devon Rex. The plan would go like this: Mike and Annie would come over for wine before dinner. I mention to Mike I discovered a cat that’s really cute and best of all, Mike would be able to visit and breathe all at the same time. But Jeff thinks it’s ugly, our friends would make fun of us. I share brochure. Mike and Annie say what a beautiful cat, followed by, Jeff you’re wrong. Jan gets cat. Mike and Annie agree to the plan. Like I said, they are good friends. Okay, so maybe the cat in the brochure looked a little extreme. Fast forward ten years. Our son is now 21 and attending the University of South Florida and living in the burbs of Tampa. He’s staying in a home we bought to house his 77 year old grandfather. Kind of a lonely existence for a college guy. The Tampa home could really use a warm fuzzy cat. After having watched his mother pine for a certain cat forever, he hatched a plan to find an attractive Devon Rex. No small task based on my ten year track record. The master researcher found this little dude on the internet. He plays fetch, (his record is 45 minutes). He greets our son at the door and wags his tail. And he’s leash trained. Cutest damn cat ever. Just don’t tell him he’s a cat. (Or that his ears are too big). Hmm…I think you are more than an art director. You give Mike a run for his money! Awww shucks. I wish. Writers are so darn witty. “they drive home and talk about how weird my husband is and that doesn’t stop me from keeping him” I laughed out loud at that one! Those cats are gorgeous !! The pic of the one in the car is the coolest photo !! love it !! Do you have cats? Share a photo when you email before and after pics of your project.